Options include stopping at Boulders beach for penguin viewing and the Cape Point Nature reserve. Overnight accommodation can also be arranged in Fish Hoek or Simon's Town. Tours can be arranged from your place of accommodation or from our base in Fish Hoek. Join us on a journey from the Tsitsikamma to Cape Town via Oudtshoorn and the scenic Route 62 (the world's longest wine route). Sight seeing includes the Big Tree, Storms River Mouth, Ostrich farms, Port tasting in Calitzdorp with the Peninsula tour forming the final part of this epic journey. A Hike up Table Mountain rounds off the trip in style! All our bikes are top quality, minimum 18 speed, aluminium/carbon frames and 24 Speed MTB’s; ENQUIRE ABOUT OUR RATES. They come with a choice of SPD, SPD SL or standard pedals. These can be hired out daily, weekly or monthly. You decide. We can also provide BASIC helmet hire if needed, as this is a legal requirement. A drop off and collection service to your door for convenience is available for a small fee to the central areas of the City and surrounds. TANDEMS are available too! In May 2015 we launched our first Namibian tour. Do you fancy cycling to the red dunes of the Kalahari, traversing the bridges of the Fish river canyon, seeing the wild feral horses of the oldest desert in the World in 2018 ? The Namib boasts sparse Quiver trees, enormous nests of weaver birds and wild Kudu amidst the wide open spaces of the country. Alternatively, we can start the Tour from Cape Town and end in Windhoek, cycling up the West Coast of each country. Normally we start in Windhoek and head to the South after which you could end your journey with a Safari in the Etosha Pan and surrounds from Windhoek. We do not travel into the infected areas in the North so no need for anti-malarials. The tours run May to October FYI. Please click on the button FFI. In the words of Nelson Mandela, "Education is the most powerful weapon you can used to change the world." In preparation for the Fourth Industrial Revolution, we have teamed up with Leaderless to plan the Long Ride To Freedom, a journey to educate all South Africans about potential job losses due to digital disruption whilst giving them the necessary tools to learn how to take extreme ownership of their own lives. We are running a PRE-ARGUS TRAINING TOUR along the Garden Route arriving back into Cape Town on Thursday 7th March to help get you in shape for the big day with top tips from seasoned local riders. Please ask what's running race week for your day tour options too. Send an email to enquire about availability and pricing before they're sold out! ​All hires have a 5-day minimum rental period for race week FYI. We have a fleet of ROAD and MTB's with slicks including TANDEMS available. ​ARGUS 2019 AVAILABLE INCLUDING TANDEMS! We can arrange a sports massage for you after your event or even before by prior arrangement. Cost ranges from R350-R550 per person dependent on your location (on-site or at your accommodation) and length of time of the session. Please email your requirements so we can give you an accurate quote. Shirts - we would ideally like you to wear your own bright clothing or one of our CycletheCape Hi Vis over shirts which are bright yellow for safety and visibility. Drinks - water bottles will be provided however should you require a specific drink you would need to bring these/buy them yourself. 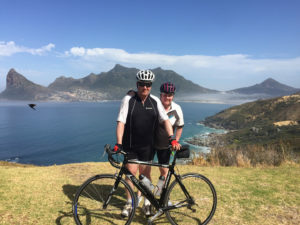 Qualified first aider/cycling tour guide - Mark and staff are qualified first aiders so you have complete piece of mind en-route. Accessories - tubes, bike levers, pumps etc will be provided by us. Transportation and accommodation - full vehicle support is also available should this be required and bed and breakfast for multi-day tours. SPD, SPD SL or LOOK Keo compatible shoes or your own shoes and pedals - we can fit normal pedals but these are not ideal for hill work. Helmets and/or Saddles - rent ours or bring your own, this is a legal requirement, along with your own saddle perhaps for comfort on the multi-days.